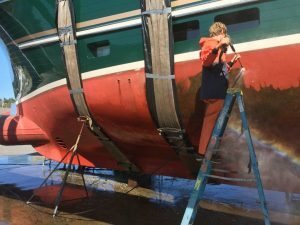 A ban on the use of antifouling copper paints in Washington state has been delayed until more research can be conducted to identify safe alternatives. The legislation approved in 2011 banned the sale and use of copper antifouling paint that contains more than 0.5 percent copper. The first phase of the ban was set to go into effect January 1, 2018, and stipulated new recreational boats (up to 65 feet) may not be sold with copper-based antifouling paints. 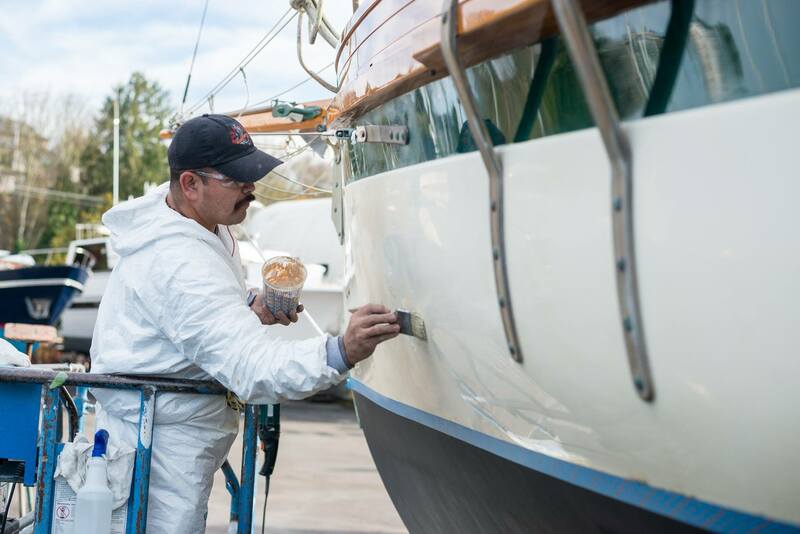 The second phase banned the sale of copper-based antifouling paints for recreational boats and prohibited the application of copper-based paints to boats beginning January 1, 2020. The ban did not apply to recreational boats greater than 65 feet or commercial boats. Washington state was the first state to adopt anti-copper paint guidelines in an effort to protect water quality. The law also required the Washington State Department of Ecology to survey the types of antifouling paints sold in the state and how those paints affect water quality and marine life. During that process, it was discovered that some of the alternatives could also have adverse effects, prompting the Department of Ecology to request a delay on the copper paint ban. 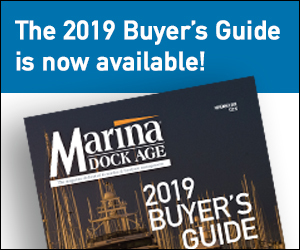 After the legislation passed, Schrappen and NMTA set about educating boat owners, marinas and boatyard operators about the new requirements. They attended boat shows and other industry events and developed a variety of educational and marketing materials. “I thought everything was hunky-dory,” Schrappen said. But in 2017, he wrote an article about the phase-out of copper paints, and suddenly he started getting a lot of phone calls and questions. He said they were told “hold-on, time out” because there was concern that there were no acceptable alternative paints. “It was quite a startling development,” Schrappen said. On March 15, Washington’s governor signed a bill that delayed all phases of the ban until January 1, 2021. The new bill addresses other potentially harmful antifouling paints, not just copper, and the restrictions regarding copper paint would not apply to recreational boats with external hull surfaces constructed entirely of wood planks or sheets. The new bill directs the Department of Ecology to assess the impacts of antifouling paints and their ingredients, to identify safer alternatives, and to make recommendations on whether changes to existing regulation of antifouling paints are needed. The department’s report is due to the legislature by September 30, 2019. Goetz said the Department of Ecology has two primary tasks: 1) to collect data about marinas in the state and 2) to use that data to run a scientific model that will show how each type of biocide will act in the state’s waters. The scientific model they will use is the “Marine Antifoulant Model to Predict Environmental Concentrations.” Goetz said the model has been used by scientists and regulatory agencies around the world since 1999 to predict how biocides from antifouling paints act in the environment. The information gained during the process will help the department develop recommendations to the legislature on the best strategies for regulating antifouling paints. The department’s report to the legislature in December suggested introducing a leach rate limit to help reduce the amount of copper pollution from antifouling paints. The state of California has applied such a limit on paints used on recreational vessels. The U.S. Environmental Protection Agency has also proposed a similar approach. Schrappen also is in favor of looking at this as a possibility to address the copper level in the state’s waters. He said NMTA will work with the Department of Ecology as needed to develop a common-sense approach that improves water quality and gives boaters more choices for protecting their boats. Goetz said the Department of Ecology is interested in talking with representatives from the boating industry and other stakeholders about paint antifouling performance data as the department conducts research and develops recommendations to present to the legislature. With the delay on the ban now in place, Schrappen said it is “business as usual” for marinas and boatyards. Goetz said boaters can continue to use copper paints for now. However, marinas and boatyards that have problems with high copper levels should adopt best management practices to help manage copper levels. Boat manufacturers can also continue to use copper paint on new boats, but the Department of Ecology encourages them to consider using less toxic alternatives. According to the Department of Ecology, there are 30 non-copper biocidal paints registered for use in Washington state. 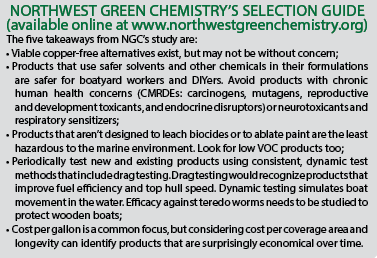 Five non-biocidal alternatives to copper-based antifouling paints were also identified in a study by Northwest Green Chemistry. The Department of Ecology worked with Northwest Green Chemistry (NGC) to develop the “Washington State Antifouling Boat Paint Alternative Assessment Report” that was released in October 2017. All the alternatives, including non-paint alternatives, were assessed for hazard, cost and availability, performance and exposure. “Stakeholders were involved throughout, including advising on the criteria, metrics, data collection methods and communication of results,” Nestler said. Using the data collected, NGC developed a selection guide of alternative products available in Washington (see the sidebar on this page). “Depending on how you use your boat, your maintenance patterns, and what the hull material is, different alternatives will work better,” Nestler said. Many of the common paints listed in the guide are available in stores, while others would need to be ordered and shipped. None of the alternatives identified have been tested for efficacy against teredo worms to protect wooden boats. The Selection Guide is available on Northwest Green Chemistry’s website: www.northwestgreenchemistry.org.